Elena Pakhoutova discusses ‘Collecting Paradise’, a new exhibition at the Rubin Museum of Art that explores how, for centuries, the Buddhist art of Kashmir intrigued and influenced artists and patrons from the Western Himalayas. ‘Collecting Paradise’ celebrates Buddhist art of Kashmir and Buddhists from neighbouring regions of the Western Himalayas who ‘collected’ it. In the process, they created their own art and culture in which Kashmiri aesthetics were adopted and then remembered centuries later. The exhibition presents the art of Kashmir within the context of people who treasured and collected it in the 7th through the 12th centuries: the Buddhists from the Western Himalayan kingdoms. They embraced and later reinterpreted Kashmiri aesthetics, defining their own culture. The exhibition was organised in collaboration with the Mary and Leigh Block Museum of Art, Northwestern University. It was conceived and curated for the Block Museum by Rob Linrothe and I was glad to curate it for the Rubin Museum. I have always loved the art of Kashmir and it generally falls within my expertise. 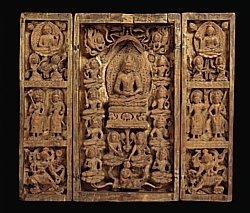 There are quite a few highlights that represent different time periods and areas within the exhibition’s narrative, such as Traveling Shrine, Vairocana with Bodhisattvas from the collection of the Nelson-Atkins Museum of Art in the ‘Buddhist art across borders’ section; carved ivory sculptures from the Cleveland Museum of Art, a Hayagriva sculpture from the Saint Louis Art Museum, and Crowned Buddha from the Asia Society New York in ‘What They Saw: Western Himalayans in Kashmir’ section; and illuminated manuscript pages from LACMA in the ‘What they created: Western Himalayan culture’ section. It was revealing to see the connections between the art from Kashmir and the other regions, and to see the diverse patronage of art, with women depicted or named as donors. This made me once again appreciate the fact that none of these amazing objects would exist if not for these patrons and artists. The greatest challenge is to make these fairly unusual images relatable to visitors, so that they can truly appreciate the aesthetic qualities of the objects and their meanings. We tried to make these details evident and accessible in our interpretive texts, which invite visitors to look closely at the objects. The exhibition narrative progresses through various sections, which showcase objects from two different regions, Kashmir and the Western Himalayas, separated by space and time but connected by the common aesthetic. Several important loans come with their own mounts, and it will take some creative work to match their style with that of our installation. It would have been great to show the only surviving example of Kashmiri painting, the Gilgit painted manuscript covers from the Shri Pratap Singh Museum in Kashmir. I would also have liked to show Three Bodhisattvas from the Pritzker collection – a sculpture that truly demonstrates the unique Western Tibetan aesthetic of 13th century. ‘Collecting Paradise: Buddhist Art of Kashmir and its Legacies’ is at the Rubin Museum of Art, New York, from 22 May–19 October.